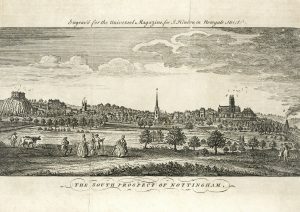 Apart from the odd squirrel or blackbird, or duck on a pond, it is not usual to associate parks with animals, but some of Nottingham’s parks and open spaces have long-standing associations with animals of all kinds. The Forest, for example, was grazing for cattle at the beginning of the 19th century. Until 1845, when the Enclosure Act was passed, the town’s burgesses had the right to graze their cattle on The Forest. Cattle and sheep also grazed on The Meadows and sometimes interrupted the cricket matches that were played on the fields after the hay had been mown. 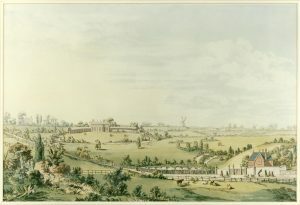 In order to protect the newly refurbished race track on The Forest in 1854 the Council erected fences to prevent cattle wandering over the course. More fences were erected in 1859 to protect the newly planted trees on the southern slopes from grazing animals. As late as 1881, the town’s Pinder (the man who rounded up stray animals) was instructed to impound any goats, sheep or geese that strayed into The Forest. Formal races were held twice a year and horses could graze on the Forest overnight, if necessary. 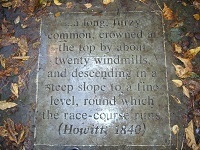 In the centre of the race course was a trotting or exercise course used by ‘gentlemen’ to exercise their horses. In 1882, George Taylor, a Lace Manufacturer, complained that some of the gates to the Forest had been closed which he felt was dangerous in case a horse bolted while being exercised. In more recent years, a huge variety of animals were seen on The Forest. Chipperfield’s, Billy Smart’s and Lord George Sanger’s circuses were all regular visitors. All had live animal acts, and animal side shows often made up the Goose Fair festivities, leading to protests from the Performing Animals’ Defence League and the Jack London Club on the grounds that no animal can be trained without a degree of cruelty. Cattle were once more seen on The Forest in 1957 when the National Milk Publicity Council held their June Dairy Festival there. Rather more bizarrely, in 1954 the Council was approached about the possibility of exhibiting a whale, named Jonah, on the Forest. Caught near Trondheim, it weighed 58 tons and was 65 feet long. It had already been on display in London (see Pathe newsreel film of it being unloaded at the docks). Unfortunately, the correspondence does not say whether the exhibition happened or not, so if you know someone who saw Jonah, please get in touch. Rather more conventional are the animals which have been seen in the Arboretum. In 1880 forty ‘goldfish’ were taken from Basford Reservoir and put in lake (which was rather bigger than the current pond). They probably did not last long, because a pike lived in the lake and it seems to have eaten all the other fish. In 1881 the pike was removed and more goldfish were introduced. The following year, two dozen (24) lizards were bought by the Council for display in the Arboretum and on Castle Rock. 1884 saw the introduction of bream into the lake and black swans on the surface. Seven years late, the swans were removed because they were vicious and had killed several of the resident wildfowl. 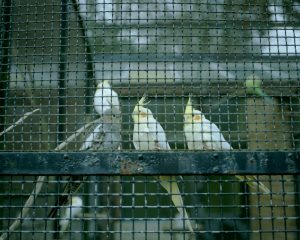 In 1890, the aviaries were erected by a Mr. W. Bardill. They were stocked with birds and 500 copies of a catalogue were prited, which could be purchased for the princely sum of 1d (one penny). Cocky the Cockatoo in 1956. 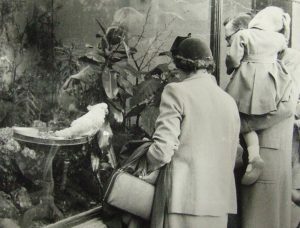 Perhaps the most famous resident of the aviary was Cocky the cockatoo, who died in 1968, it is said at the grand old age of 114. He was a Sulphur-Crested Cockatoo called ‘goodbye Cocky’ as visitors passed. He was very popular with visitors to the Arboretum. There is no cockatoo in the original list of aviary inmates, but several are included in various gifts of birds made over the years. If you have any more information on ‘Cocky’ or have memories of him you would like to share, please get in touch. 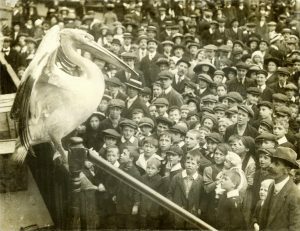 Animals are rarely mentioned in connection with Nottingham’s other inner city parks, though there is an amusing, if terrifying, story about Victoria Park in 1905. Some cattle were being driven from Sneinton to the slaughter-house in Radford. One bullock escaped and ran into Victoria Park. A report in the Nottingham Evening Post relates that ‘scores of school children were on the grass or near the swings and these bolted out by other gates’. However, a youth standing near the swings stood his ground and was charged by the bullock so he climbed up the frame of the swings till he was 10 ft off the ground, with the bullock ‘angrily pawing the ground beneath’. The bullock eventually settled down nearby, but every time the youth tried to climb down the animal rushed him, and he had to climb the frame again – while the watching crowd laughed – and balance on a bar that was 1½ inches wide for 1½ hours. After a couple of hours other cattle were driven into the park, which calmed the bullock and they were taken away. Today, parks and open spaces are havens for inner-city wildlife. A good example of this is Queen’s Walk Recreation Ground in The Meadows, which is supported by Nottinghamshire Wild Life Trust.